"Messenger for Skype™ Web" is a very light extension that allows you to access the official Skype web interface from a toolbar panel or within a sandboxed window. Using this extension you can have access to the messenger without the need to switch tabs. Please note that the sole purpose of this application is to provide a more convenient way for users of Skype Web and it is NOT THE INTENTION to mislead anyone to think this is the official application. What is the Skype™ Web add-on and how can I use it? Skype™ Web is a simple Firefox/Chrome add-on to allow you to have access to the official Skype web interface without the need to switch tabs. Note that since the panel is like an open tab, using this extension will allow you to receive messages from Skype while your browser is open. There is no need to have an open Skype tab anymore. Please note that the UI of Skype™ web is designed and maintained by Skype team. This extension only provides an easier way to have access to this service. You need to read and agree with Privacy & Terms in order to use this service. Is it possible to change the width or height of the panel to fit it with my monitor (Firefox only)? Yes, open "about:addons" in a browser tab. Now find Skype™ Web add-on and change the width and height. Please note that the minimum acceptable values are 300 pixel for both options. Note that you can also open the options page from the panel by pressing the settings button as well. Can I change the position of the toolbar button (Firefox only)? Yes, simply right click on a free space in the toolbar area and select "Customize ..." item. Now you can drag and drop the icon to the proper location. For more customization options please visit a Comprehensive Guide to Firefox Customization. You can open Skype web, FAQs page or the bug reporter directly from the panel. Also you can refresh the panel. If you need a new feature post a bug report and I'll try to add this it in the next release. Do I need to keep the panel open while I am on a call with Skype (Firefox only)? No there is no need for that. The panel is always open no matter if it is visible or not. Clicking on the toolbar button just makes it visible. So it is safe to close the panel when you are on a voice call with a friend. Do I need to install any plug-ins to use Skype Web? If you only intend to use this extension/application for text messaging, there is no need for any plug-ins. However, if you intend to place voice or video calls, you will need a plug-in. 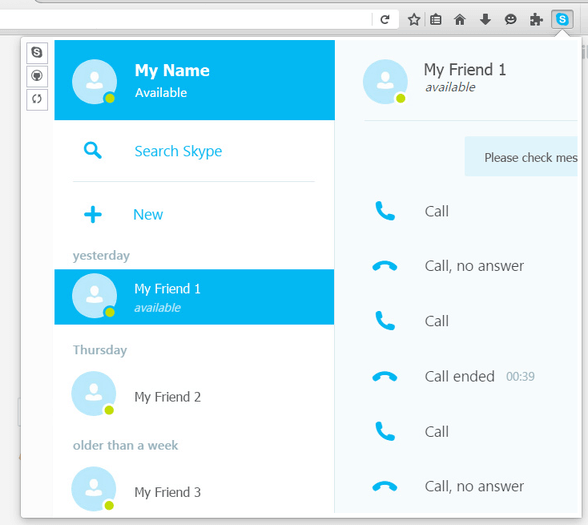 Open https://web.skype.com/ in a browser tab and press on a call button and Skype will redirect you to the plug-in page. Once the plug-in is installed, refresh the panel or window and you should be able to place calls directory from the window or panel view. On Chrome, it is necessary to install "Skype Call" extension along with the OS dependent plug-in to be able to place calls. In Firefox version, if you get "Plug-in is not installed" message even if you have already installed the plug-in, try to disable the multiprocessing from Options page of Firefox. Seems like plug-in support is still not fully e10s compatible. This should be resolved in the future versions of Firefox.